Complete bathroom remodel over $2500. Not valid with any other offer or finance program. Expires 5/23/19. Any Grout Doctor Service Must Present this ad during estimate. Not valid with any other offer. Expires 5-23-19. *Cannot combine offers. Call for details. Offers expire 5/23/19. Limited time offer. Expires 5/23/19. Purchaces over $1000 cannot be combined with any other discount, offer. cannot be used on sale items. Expires 5/23/19. • Enclosure Rehab • Replace Rusty Screws • Re-Screening • Private Screens • Privacy Curtains • LED Lighting • Color Changing LEDs • Repairs & More! Your order with this ad. Call for details. Exp 05/23/19. 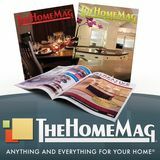 With TheHomeMag offer only. Exp 6/15/19. Minimum area applies. 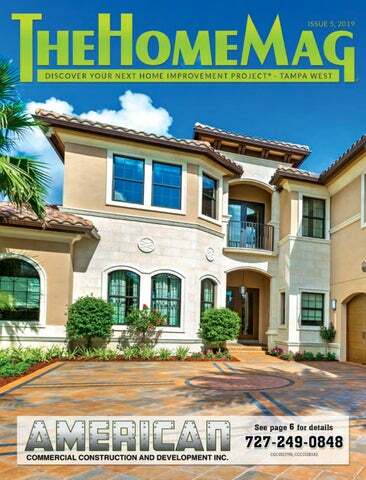 With TheHomeMag offer only. Exp 6/15/19. Coat of Acrylic Sealer With Stucco/Masonry Exterior Paint Jobs Not valid with any other offer. Valid with this ad only. Expires 05-23-19. Restrictions apply. Call for details. Expires 5/23/19. ▪ Repairs ▪ Emergency Repairs ▪ New Installation ▪ Re-roofing Family Owned and Operated ROOFING and REPAIR SERVICES 60 years in the Tampa Bay Area Expires 5/23/19. Call for details. Exp 05/23/19. *$79 per month based on (7) energy-efficient windows with heat-reducing glass. With approved credit. One offer per customer. Offers can’t be combined. SALE $2,999 Installation not included. *Single story cages only. Call for details. Offers expire 5/23/19. Call for details. Exp 5/23/19. With this offer. Minimum purchase required. Not valid with any other offers or prior purchases. Offer expires 5/23/19. Any job over $1000. Exp 5-23-19. Are you Struggling to open that heavy door? Donâ&#x20AC;&#x2122;t replace your DOOR, Let us replace the ROLLERS! • Wide assortment of available blends and finishes. • UV stable Coatings will not yellow, fade, chip or peel due to sunlight exposure. • Additives added to improve traction coefficients. • 1-Day Installation with next-day return to service. • 3x more durable than epoxy. • Low-emitting green friendly coating. We guide you step-by-step through the entire process, from product selection to permitting, and installation to inspections, all the way through to final completion.